This site is to be used by you for your personal use only. Commercial uses of this site are strictly prohibited unless prior written consent from Sheriva has been granted. You agree that you will not use this site for chain letters, junk mail, spamming, solicitations (commercial or non-commercial) or bulk communications of any kind including but not limited to distribution lists to any person who has not given specific permission to be included in such a list. In addition, you agree not to create a hypertext link from any web site controlled by you or otherwise, to this site without the express written permission of Sheriva. You agree not to pretend to be any other person or a representative of any entity, whether actual or fictitious, including an employee or agent of Sheriva or any third party that provides services related to this site. You may only use this site to make legitimate reservations or purchases and shall not use this site for any other purposes, including without limitation, to make any speculative, false or fraudulent reservations, or any reservation in anticipation of demand. All information, documents, and other materials provided on our website and the underlying software code are owned directly by Sheriva. Without prior written permission, you may not copy, modify, alter, publish, broadcast, distribute, sell or transfer any material on this website or the underlying software code whether in whole or in part. However, the contents of this website may be downloaded, printed or copied for your personal non-commercial use, except where previously authorized. Any unauthorized use of this website may result in a violation of copyright laws, trademark laws, the laws of privacy and publicity, and communications regulations and statutes. Nothing in this website should be construed to be a grant of a license, ownership or any other proprietary right in this website, its contents or the underlying software code. 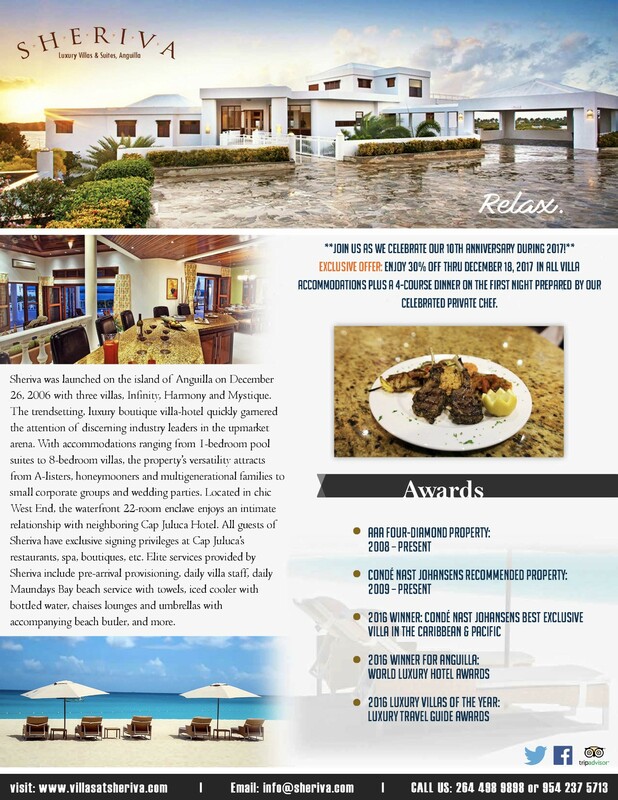 You may only use this website in accordance with our Terms and Conditions and, in any event, for lawful and proper purposes which includes complying with all applicable laws, regulations and codes of practice on Anguilla, British West Indies and any other jurisdiction from which you are accessing this website. We reserve the right to make updates to the information, rates, services, products and other materials on this website at any time without notice. We may also modify the Terms and Conditions at any time, and such modification shall be effective immediately upon posting of the modified Terms and Conditions on this website. Accordingly, your continued access or use of this website and its contents is deemed to be your binding acceptance of the modified Terms and Conditions. We respect the privacy of our users, and do not collect information from you without your knowledge. We need the following information in order to process your requests: your name, e-mail address, and contact telephone number. If you are making a reservation, we also require your credit card number, its expiry date, and security code. We use the information we collect to process your requests and to notify you of its status. We will not release your personal information to outside organizations or persons.